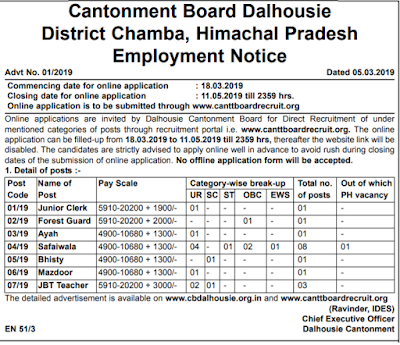 Basic Info: Online applications are invited by Dalhousie Cantonment Board for Direct Recruitment of under mentioned categories of posts through recruitment portal i.e. www.canttboardrecruit.org. The online application can be filled-up from 18.03.2019 to 11.05.2019 till 2359 hrs, thereafter the website link will be disabled. 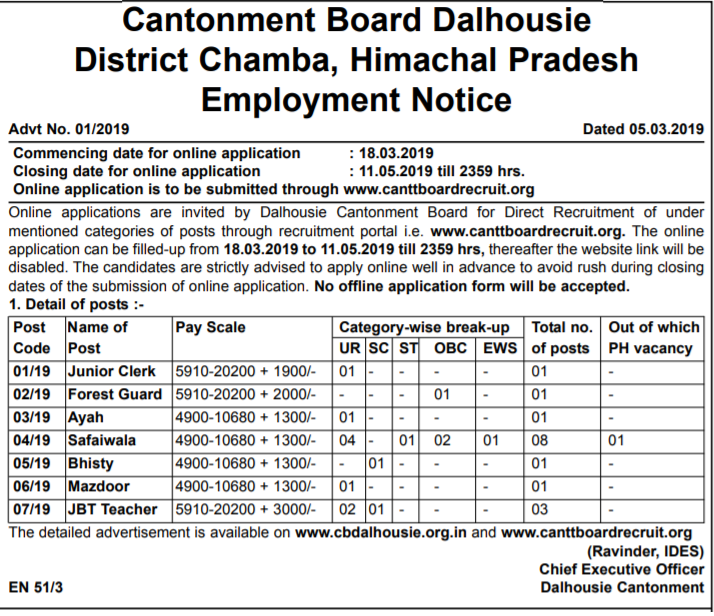 The applicants are firmly counselled to apply online well in advance to avoid rush during closing dates of the submission of online application related to these Govt jobs in HP. No offline application form will be accepted. Education: (i) Must have passed 10+2 examination or its equivalent from a recognized Board of School Education or University. (ii) Must have a minimum typing speed of 30 wpm in English typewriting or 25 wpm in Hindi typewriting on computer. (iii) Must have the knowledge of “MS word and Excel” on computer as prescribed by the Recruiting Authority. Education: Must have passed 10+2 examination or its equivalent from a recognized Board of School Education or University. Education: Middle (8th) standard pass. Education: (i) Senior Secondary (or its equivalent) with at least 50 % marks and 2 years Junior Basic Teacher (JBT) / Diploma in Elementary Education(D.EI.Ed.) (by whatever name known). Graduation with 50% of marks and have a degree in Bachelor of Education(B.Ed). (ii) Pass in the Central Teacher Eligibility Test from (CTET) conducted by Govt. of India or pass in the Teacher Eligibility Test from (TET) conducted by an authority designated by the concerned State Government. Age Limit- Age boundary as per existing rules under CFSR 1937 is 18-25 (age as on 11.05.2019) and age relaxation for Ex-servicemen who has put in not less than 6 months continuous service under the Armed Forces of the Union, shall be allowed to deduct the period of such service from his actual age and if the resultant age does not exceed 25 years by more than 3 years, shall be deemed to satisfy the conditions regarding age limit. Application fee will be non-refundable. Fee is to be paid through online payment mode only. Closing date for online application : 11.05.2019 till 2359 hrs.